I quoted the famous Marianne Williamson once before: “A miracle is simply a change in perception.” That being said- the only thing I really feel I need on this raw food diet is some type of bread. Besides my fruits and vegetables, I have been living off homemade dehydrated granola and experimenting with dehydrated crackers. I was so excited to find a whole chapter on breads in this new book that I am reading: Rainbow Green Live-Foods Cuisine by Gabriel Cousens, M.D. The recipe called for nutmeg or cinnamon however I forgot this but it’s worth mentioning because it would be a nice added flavor. I created the pulp for the carrots while making my morning juice. I also put the soaked ( & drained) almonds through the juicer and created a pulp or a wet almond meal. This was my first time experimenting here. If you look closely at the glass measuring cup it looks like almond butter. I am getting there! I mixed everything together and formed little squares. 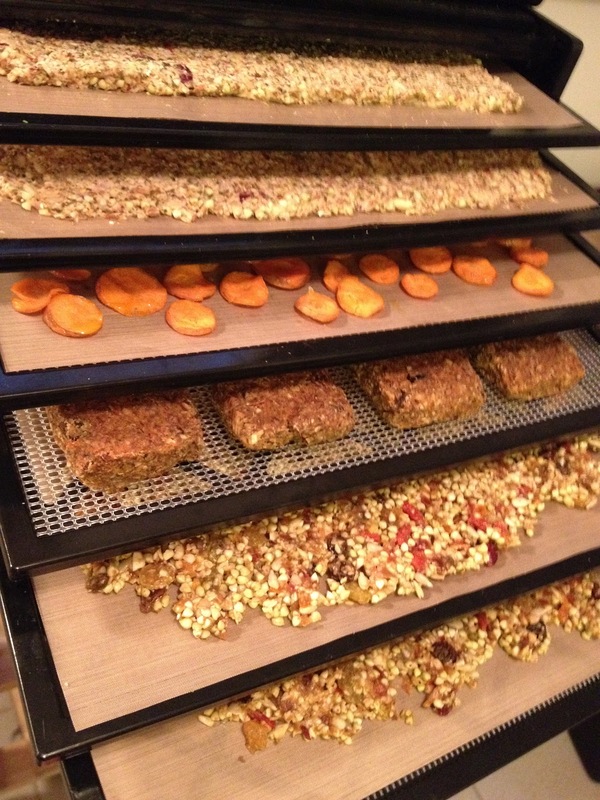 I put these on the teflex sheets and then into the dehydrator at 105 degrees for almost 24 hours. The recipe calls for temperatures at 145 for 2-3 hours and then 115 for 2 hours. I have to read more about these temperatures. There is a reason he goes that high without killing enzymes. Personally, until I figure that out, I will stay at 105. These carrot nut breads came out interesting! I wasn’t sure if I would like them but they came out pretty good. Mostly all of my friends who tried it liked them as well! Not bad for the first time!